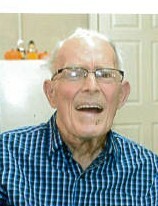 Mr. Billy Gray Doss, 87, of Mt. Airy passed away Thursday, February 07, 2019 at his home surrounded by his loving family. He was born in Surry County on August 27, 1931 to the late Fred and Viola Byrd Doss. Mr. Doss retired from Bill’s Barber Shop and was a member of Shining Light Baptist Church. Mr. Doss proudly served our country in the United States Army during the Korean Conflict where he received a Purple Heart and a Bronze Star. He will be dearly missed by all his family and many friends. He is survived by his wife, Laura Ann Newman Doss; two daughters and son-in-law, Debra Reeves and Mike; Dawn Crutchfield; a son and daughter-in-law, Pastor Jonathan Doss and Sara; grandchildren, Michael Reeves and Emily, Matthew Reeves and Laurie, Amanda White and Zach, Daniel Crutchfield and Mandy, Nathan Crutchfield and Whitney, Jessica Harrison and Michael, Luke Doss and Abby, Ben Doss and Stephanie, Ellen West and Adam; twelve great grandchildren; a brother and sister-in-law, Roger Doss and Glenda. In addition to his parents, Mr. Doss was preceded in death by a sister, Faye King; brothers, Paul Ray Doss, and Jack Doss. A funeral service will be held Sunday, February 10, 2019 at 2:00 PM at Moody Funeral Home Chapel with Pastor Jonathan Doss and Rev. Elmo Hiatt officiating. Burial will follow in Union Hill Friends Meeting Church Cemetery with full military honors conducted by VFW Memorial Honor Guard Post 2019 of Mt. Airy and Post 9436 of Pilot Mountain. The family will receive friends Saturday night from 6:00 until 8:00 PM at Moody funeral Home in Mt. Airy. Flowers will be accepted or memorial contributions may be made to Victory Baptist Press, for Bible printing at P.O. Box 766 Milton, FL 32572. Online condolences may be made at www.moodyfuneralservices.com.